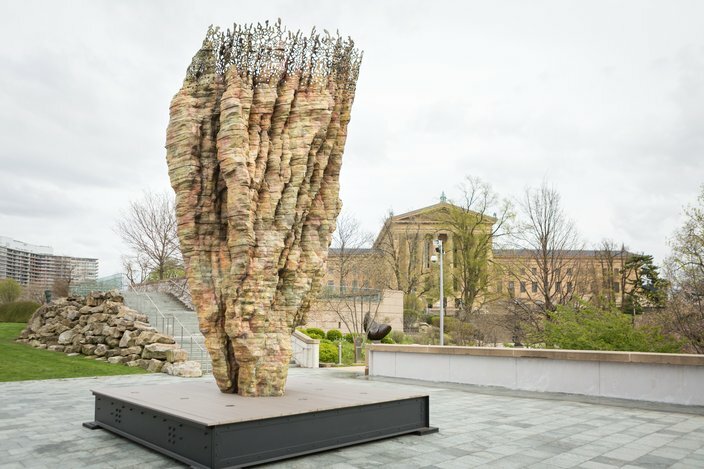 A urethane resin sculpture by artist Ursula von Rydingsvard at the Philadelphia Museum of Art's Anne d'Harnoncourt Sculpture Garden. Hair. Silk. Cotton. Yarn. Lace. Wool. Pulp, and…cow intestines. These are materials used in a number of untitled works of art by Ursula von Rydingsvard, the German-born artist whose work is now on display in two locations in town and will be throughout the summer. That’s when she decided to use cow intestines. Von Rydingsvard handled the intestines while wet, sewed them together, let them dry and tied them together using cotton string. That's how "stacked blankets" came to fruition. “Often, I say, ‘Ursula, enough of the cedar, you know?’ I’ve done probably everything you can do. But, of course, it’s never true,” she said. 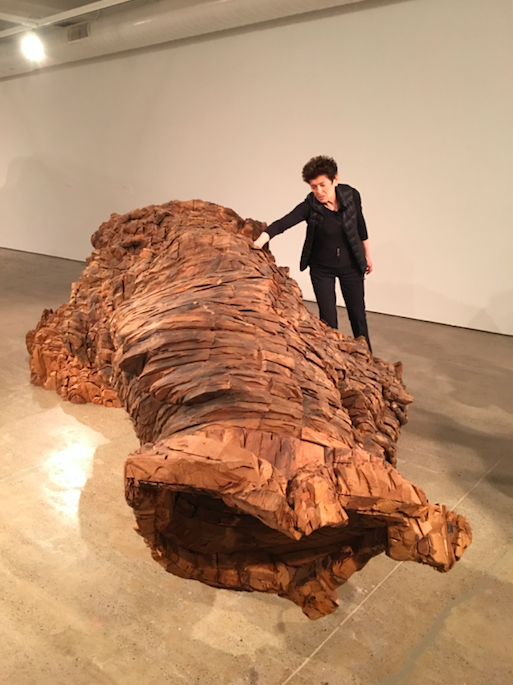 Ursula von Rydingsvard: The Contour of Feeling is a curated exhibit on display now through the end of August at The Fabric Workshop and Museum in Chinatown. It showcases roughly 20 works – mostly large-scale – and many of which have never before been seen in the U.S.
We don’t know the contour of feeling; we only know what molds it from without. A master of large-scale wooden sculpture and oversized, monumental-type works of art, von Rydingsvard is known for pieces that are complex and enigmatic. Her collections and exhibitions appear all over the world, from her hometown of Brooklyn, N.Y. to Venice, Italy. “The contour of feeling. I love this expression because Ursula is all about feeling – and – how does the artist’s feeling get manifested into art?” said Rosenthal. Ursula von Rydingsvard describes “Droga.” (2009) Cedar, graphite. 54x115x219 inches. 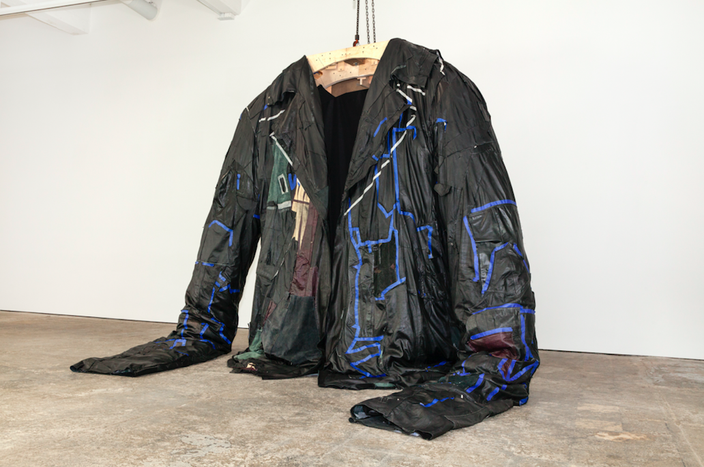 and “PODERAĆ,” a 13-ft. leather jacket made from more than 193 deconstructed leather jackets sourced from thrift stores and flea markets. The manner it's hung in the museum, its sleeves drag on the floor like a giant, invisible King Kong would be wearing it. “PODERAĆ,” in collaboration with The Fabric Workshop and Museum, Philadelphia. (2017) Leather, cotton, steel and polyester batting. She also has two pieces erected outside the Philadelphia Museum of Art. 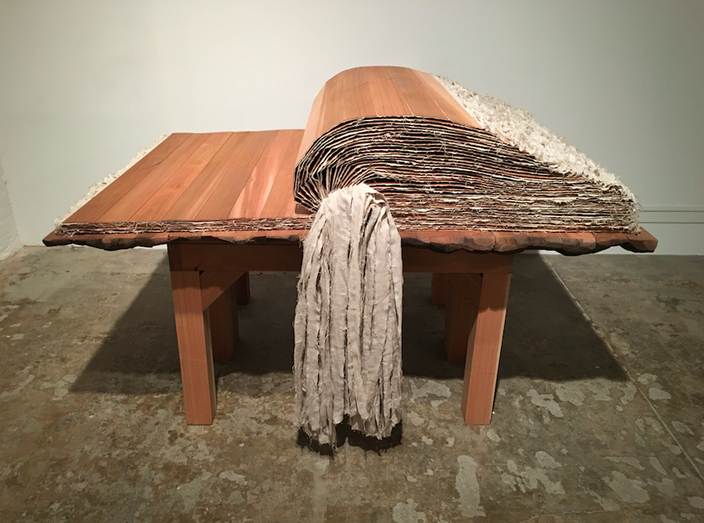 “Now, She” is comprised of two sculptures – “Bronze Bowl with Lace” and "Elegantka II." 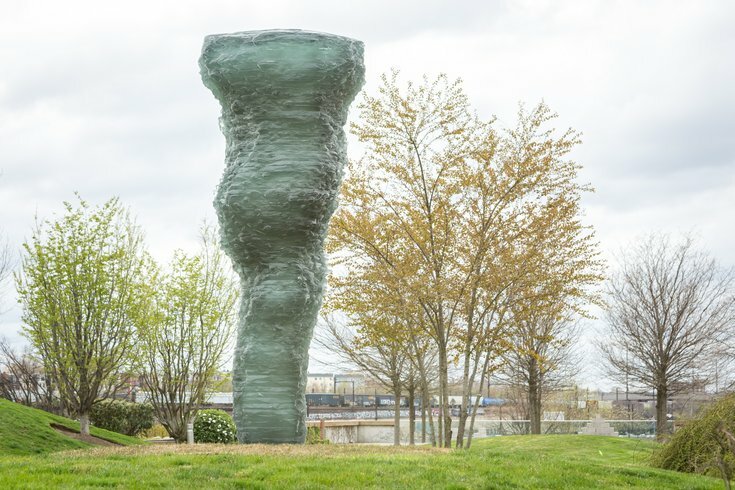 Standing nearly 20 feet tall and overlooking the Schuylkill River, "Bronze Bowl with Lace" can be seen from multiple vantage points around the museum’s exterior. Cast from a full-scale cedar model, the piece is perforated at the top and lit by the night sky as the moon slides over it at dusk. A bronze cast sculpture by artist Ursula von Rydingsvard at the Philadelphia Museum of Art's Anne d'Harnoncourt Sculpture Garden. "Elegantka II," a related work situated on a mound near the entrance to the sculpture garden, is an exact urethane resin cast of another full-scale cedar model. Together, the pieces are meant to reflect von Rydingsvard’s attention to scale, materials and techniques and embody her human emotions as she created them. 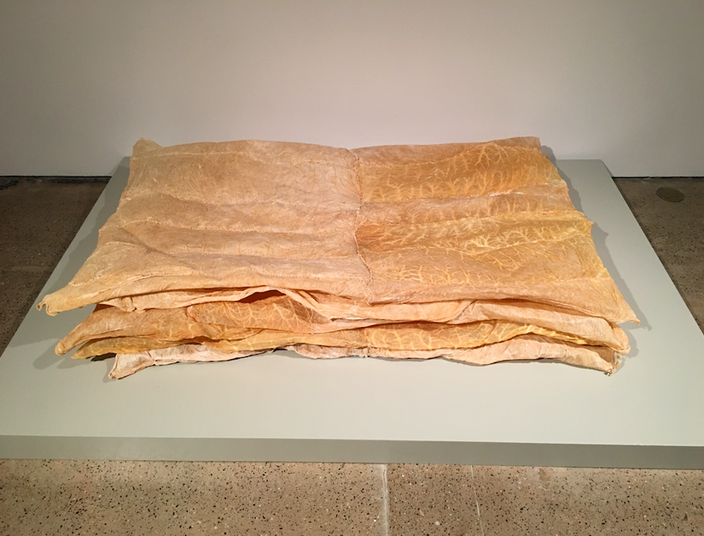 See Ursula von Rydingsvard: The Contour of Feeling now through Aug. 26 at The Fabric Workshop and Museum in Chinatown.